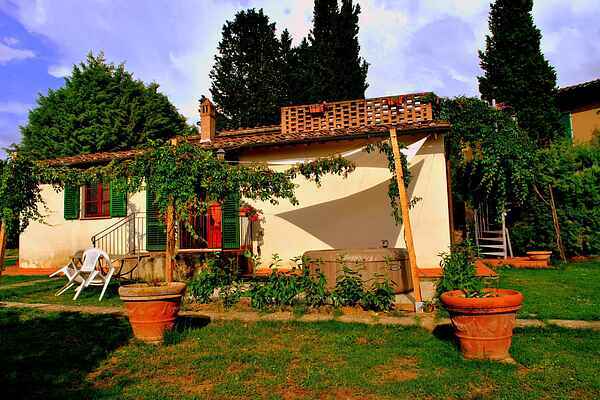 The small and very homely estate is located near Siena (12 km) on the edge of the Chianti in the hills, a peaceful landscape. Arezzo, Colle Val d 'Elsa, Volterra, San Gimignano, Assisi, Florence and the Mediterranean Sea are about an hour away from home. It's a small private estate with three houses, which is managed by Grazia and Simone. They are both very experienced in hosting and have been organizing for years wine and oiltastings, and they also sell the vegetables from their garden! The fine apartments and the swimming pool available to all make it a holiday paradise for everyone. The homeowner and his super hospitable wife and their son live in the complex and are at your disposal.